I recently received a few CLIF Crunch bars to review. To be honest, I'm thrilled! I really love CLIF bars and their wide variety of flavors so I am very grateful to once again work with this company. These bars make excellent back to school lunch box options for your children. They are also a great item to keep in your desk at work for those hold me over moments. What amazed me about these bars is the taste of each one resembled a baked good with an impeccable taste that reminded me of my childhood. The only difference being the very crunchy texture of the rolled oats. The great thing about these is that they are made with healthy ingredients so there is no guilt for filling your body with garbage. CLIF Crunch bars are made with 70% Organic ingredients and do NOT contain trans fats, high fructose corn syrup, artificial sweeteners, artificial flavors or ingredients containing GMO's. Each package of CLIF Crunch contains 2 thin bars. Together they contains a serving of whole grains, 4 grams of protein and has 3 grams of dietary fiber. The classic peanut butter flavor of the peanut butter bar reminds me of a crunchy peanut butter cookie. I happily devoured this bar. Maybe I'm a fan of fruit flavored deliciousness but I must say, the fruity taste of the Blueberry Crisp bar really floored me. It tastes reminded me so much of my grandmothers homemade blueberry muffins. The White Chocolate Macadamia Nut bar reminds me so much of squares that I've sampled in the past at baby showers. I'm a fan of white chocolate and it really does satisfy a different craving altogether than the other two bars. The CLIF Crunch bars are also available in Chocolate Chip. You can find CLIF bars at your local Whole Foods, Bulk Barn, Choices Markets or London Drugs. They can also be found in the natural food aisle at most local grocery stories and most Health Food stores. Disclaimer: I received a few samples of Clif Crunch bars to review on my blog. All opinions are my own and based on my own personal experience with the product. Occasionally, I receive a product that is not organic, natural or green; but I still want to give it a fair review. I may not agree with the ingredients used in the product but the product is still effective and it gets the job done. About a week ago, I received an All-In-1 Facial Scrub and an All-In-1 Facial Lotion as a Klout Perk. 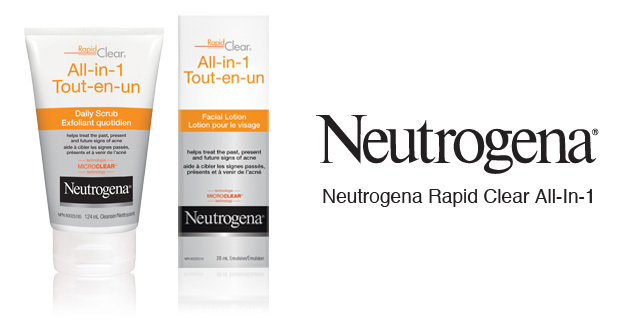 These two products are a part of the Neutrogena® Rapid Clear - All In 1 Acne Control product line. While I was not required to blog about these products, I would still like to share my opinion with everyone. As I said in the above paragraph, I do not care for the ingredients used in this product. It does not, however, prevent the effectiveness of the product; though from my perspective long term use would equate an imbalance in the skins oil production. While I would prefer to see the company utilize more natural/organic ingredients, the product is quite effective in the short term. Meaning that the scrub effectively cleans and dries out my skin in an effort to keep any current acne and (as the product claims) future acne at bay. It has been extremely humid in coastal Nova Scotia this last week so everyone is extra oily and sticky and I barely put a dab of the scrub on my finger tip and it cleaned and cut through all of that oil. I am curious to see how effective the product would be in the winter months when my skin is a little dryer/weathered. It should be noted the primary non-medicinal ingredient in the scrub is alcohol which is noted for it's drying properties. It did not create any patches of dried skin on my face and the lotion did a terrific job at replenishing my skins moisture without leaving my skin greasy. It is important to note that the vast majority of products I use are chemical free or contain less chemicals then what you will find in the grocery store so the amount of product needed many differ greatly for someone who perhaps doesn't care as much about what is in the ingredients they purchase as the tolerance for those chemicals is different. Disclaimer: The Klout link above is a referral link and if you aren't a member I encourage you to join. They occasionally offer great perks to members with a high influence. If 6 more people sign up under me I can get VIP Klout which is a new feature and I have no idea what it entails. I received this product as a Klout Perk from Klout and Neutrogena. I was not obligated to write a review. I've harvested a little over a third of my potatoes. I've been away a lot this summer and when I returned from the New Glasgow Jubilee with my hubby and his band a lot of my potato plants were sun scalded. Animals had been at the exposed potatoes and the leaves had already started to whither and die because they were reaching maturity. I planted the potatoes in 3 batches this year and the first batch was ready. So, I dug up all of the plants from batch #1 and used the remaining dirt to bury the next 2 batches of potatoes so they don't get scalded by the sun. You lose a few potatoes when that happens. 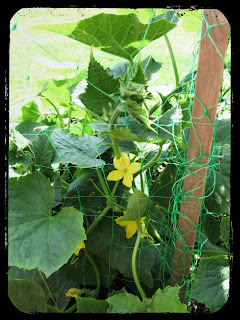 Cucumber Trellis Town is producing a wonderful yield of cucumbers. 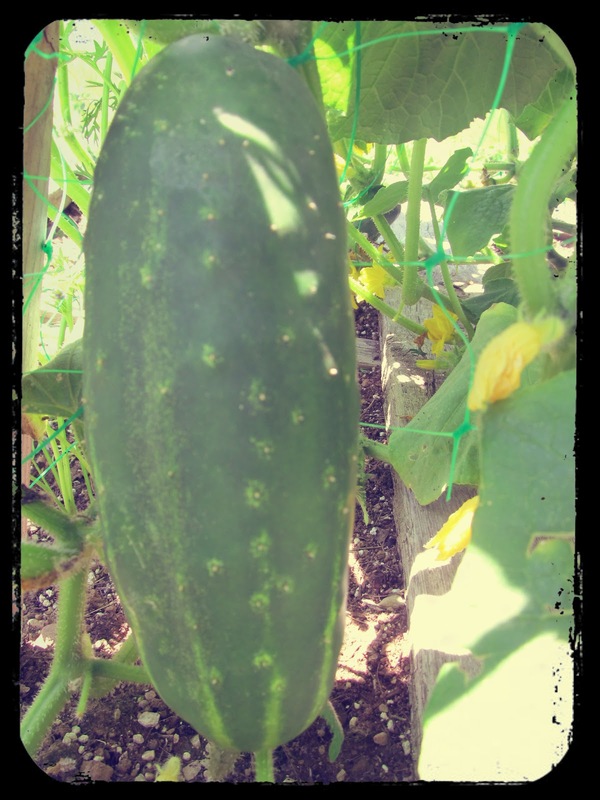 I have been fortunate enough to eat a fresh cucumber salad every day for the last week. Unfortunately, I haven't been able to keep away from the salt and as a result I am very bloated. Time to drink more water. 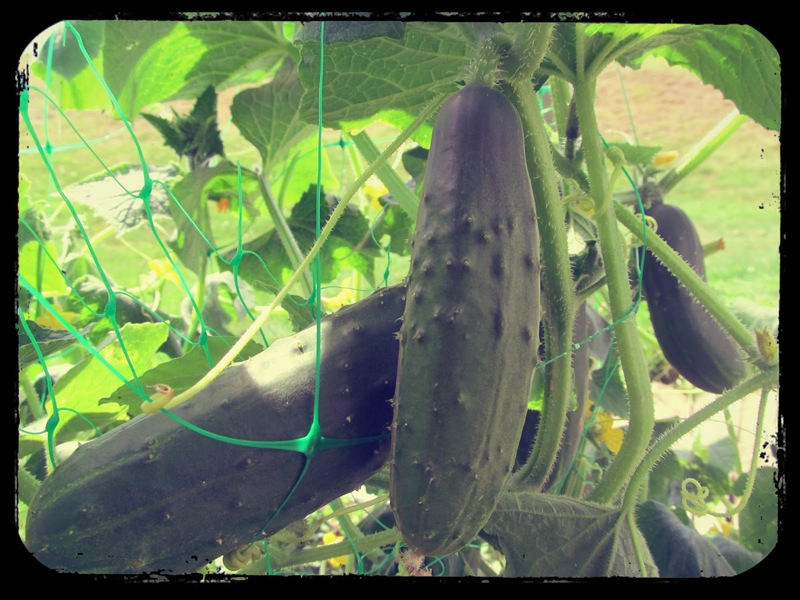 I'm excited to try the English Cucumbers that are growing. 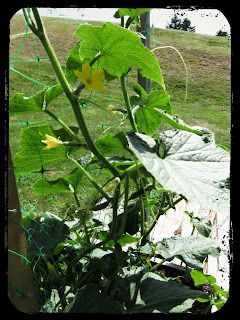 They were planted a couple weeks behind this variety in Trellis town but they are catching up quite nicely. I prefer the skin and crunch of the English Cucumbers. This variety I tend to peel because I dislike the texture of the skin. There is something very satisfying about sitting next to growing things and just breathing in the beauty of this life. I took these pictures a couple weeks ago, shortly after I began training the cucumbers to climb the trellis that I provided. I love that they are growing so well inside of a pallet. 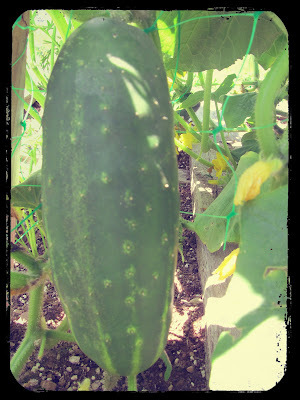 I have 8 cucumber plants, some oregano and an unexpected green pepper plant growing inside of this pallet. I'm contemplating transplanting the pepper plant however. There just isn't enough room for it to grow. Although, I really can't see it making it to maturity, it won't have a chance unless I move it. All I hear is the buzzing of bees. My mother is quite allergic but I do not fear them, instead I am grateful that they pollinate the flowers of my garden. With love, I roam. Dr. Hauschka Cosmetica is based out of Germany. They offer a wide range of natural face and body care products for all different skin types and hair types. The company was launched in 1967 by a holistic pharmaceutical company called WALA Heilmittel. I received a bottle of Lemon Lemongrass Body Moisturizer to review. While I really enjoy the scent of the product, the scent didn't initially appeal to me as a moisturizer. It is a very fresh smelling scent that I think would be very enjoyable in a natural fabric softener, laundry detergent. It would even be wonderful in a reed diffuser in a kitchen or eating area. The smell of the lemon hits you immediately, the lemongrass takes away some of the intensity of the lemon providing an aromatic balance. The scent was very strong when I first applied the moisturizer but after a short period of time it faded and became increasingly pleasant. As a moisturizer, it is non-greasy and lightweight and it leaves no visible residue or oils. It was quickly absorbed into my skin and I did notice that my skin felt slightly firmer where I applied the moisturizer. 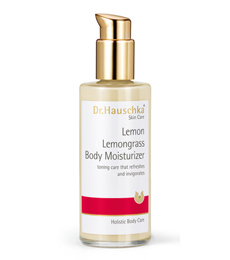 Disclaimer: I received a bottle of Lemon Lemongrass Body Moisturizer from Dr. Hauschka for the purpose of this review. 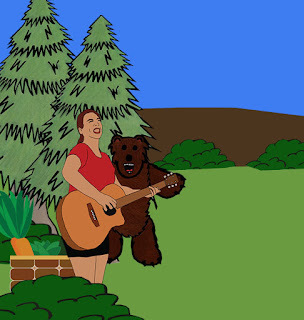 All of my opinions are honest and are based upon my personal experience with the product. I received no additional compensation aside from the product itself, for this review.